Astrology is full of gray areas. If someone believes certain zodiac signs and planets to be inherently negative, they’re being too absolute. The truth is that they may have had particularly challenging experiences with certain astrological entities, but that doesn’t speak to the same experience as everyone else. With the sun, Mercury, and Venus now charging forth through Aries, certain zodiac signs may feel weighed down by all the intense fire energy, and as of Apr. 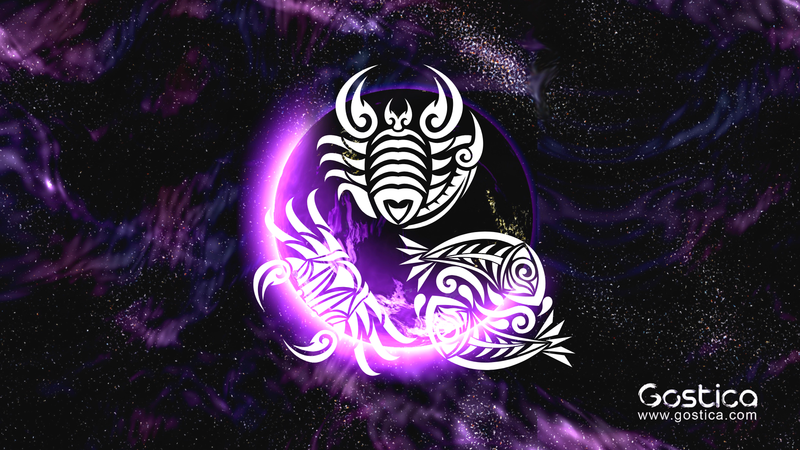 15, 2019, this will be the worst week for these zodiac signs: Scorpio, Cancer, and Pisces. If you’ve got water for your sun or rising sign, prepare for a little more turbulence this week. However, that’s not the most important reason these zodiac signs may be having a tough time. It’s also that a full moon in Libra takes place on Apr. 19. If you’re a water sign, Libra tends to offer difficulties, but also, opportunities for growth (AKA, more difficulty). Considering the fact that this full moon will be at odds with both disciplinarian Saturn and obsessive Pluto, you can expect this lunation to truly test your emotions. You’ll also feel pulled toward unpredictability and a lack of control, since it will also oppose twist-and-turn Uranus. Even if you’re feeling like the future is bleak, trust in the process. Sometimes you need to hit the bottom before you can discover the wherewithal to reach the top. Because this lunation holds hands with optimistic Jupiter, trust that this lunation has a bright plan for you. You’ve got another intense full moon headed your way that’s sure to heighten your sensitivity and possibly even make you feel easily threatened. This lunation takes place in your 12th house of self-undoing, and since it forms a square with authoritarian Saturn and compulsive Pluto, your anxieties could be high. The 12th house deals with everything lurking beneath the surface. It’s where every dangerous secret, uncomfortable memory, and shameful thought remains hidden. Since a full moon is about fruition and completion, you may no longer be able to avoid dealing with a struggle that you’ve long been dodging. Luckily, there is just as much light as there is darkness in the 12th house. The important thing to remember is that one is not more important than the other. Full moons are a time when something in your life tends to reach a sense of culmination and completion. This could take form in a revelation, a break up, a project being finished, and any other way that life lets you know it’s time to move on. Since this upcoming full moon takes place in your eighth house of death and rebirth, this sentiment is all the more prevalent for you. The eighth house deals with wills, debts, and all things that pertain to tying off loose ends, and that’s rarely ever easy to go through with. While this full moon will deepen your intuition, heighten your psychic connection, and increase the level of intimacy in your life, it’s likely going to be a transformative (aka difficult) experience. A full moon is taking place in your fourth house of home and family. You may be thinking: “Home and family? Isn’t that what Cancers are all about? Why would this be difficult?” However, it’s because Cancers care about this aspect of life so much that it might prove to be a difficult experience. This full moon will be in a battle with karmic Saturn and dark Pluto, which could bring some uncomfortable topics and deep-seated issues to light in your family. Perhaps it’s time to deal with a problem within your circle or finally face a struggle in your home life. Don’t be afraid of being honest about your feelings.